Fox plays all summer long and doesn’t take care to prepare for winter. 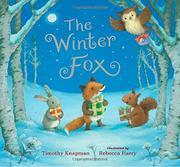 In green and golden double-page spreads, Fox gambols and loafs while his friends busy themselves preparing for winter and offering to help him do the same. When they tell him they will be snug in their dens all winter long, he replies, “I will play in the snow and sing to the wind and have the whole forest to myself!” Naturally, once winter does come, Fox finds himself bitterly regretting his imprudent ways. Thinking to himself, “Oh, I wish I’d listened to my friends,” Fox looks for a star to wish on and is bonked on the head by a falling box wrapped in bright paper. (In the distance, a dim silhouette of a flying sleigh and reindeer can be espied, the only hint of Santa’s presence in the book.) Fox opens the box and finds various foodstuffs and smaller wrapped boxes, which he distributes among his friends. After a feast, they counsel him to store the leftovers to get him through the rest of the winter. Each soft-focus illustration is embellished with silver foil for maximum sparkle, highlighting birchbark, dead grasses, and snowdrifts. All the animals are so fuzzy and nonthreatening it’s easy to imagine this Fox playing with instead of eating his squirrel and rabbit friends.